Boric acid is a common ingredient in homemade recipes for killing ants. This page is about using boric acid for controlling ants in garden and kitchen. I have a fairly large piece of property. It is mostly sandy loam. Ants seem to prefer this type of soil. At any given time, there may be several thousand ant hills on my land. Sometimes it's hard to put your foot down without stepping on one or two. It would be impractical to try to get rid of all those ants. I enjoy gardening and always have many potted plants around. Some are being made ready to go in the ground. Since I love to share my plants, some are just sitting there waiting to be given away. The ants prefer to nest in these pots over nesting in the ground. I have had large pots so heavily infested, my only recourse was to submerge the pot in water overnight. I have lost countless potted plants due to ant infestation, including some expensive Rhododendrons. I found that there is an inexpensive and highly effective means of controlling these ants. I use the word 'control' and not 'eradicate'. I can rid my home, flower pots and flower beds of ants. Eventually, more will come from other areas. It's a constant battle, but I can keep selected areas relatively ant free. Ants will eat most anything. One year, we had a lengthy dry spell. The ants were so desperate for moisture, they skeletonized several of my six foot tomato plants. With that said, I would like to add that though ants will readily ingest sugars, fats and starches, their preference is protein. 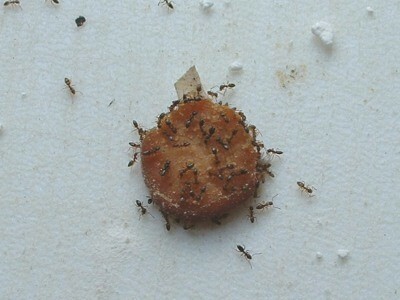 Knowing their preference for protein, I concocted a simple ant bait which is highly effective. This bait does not kill immediately, and this is a good thing. 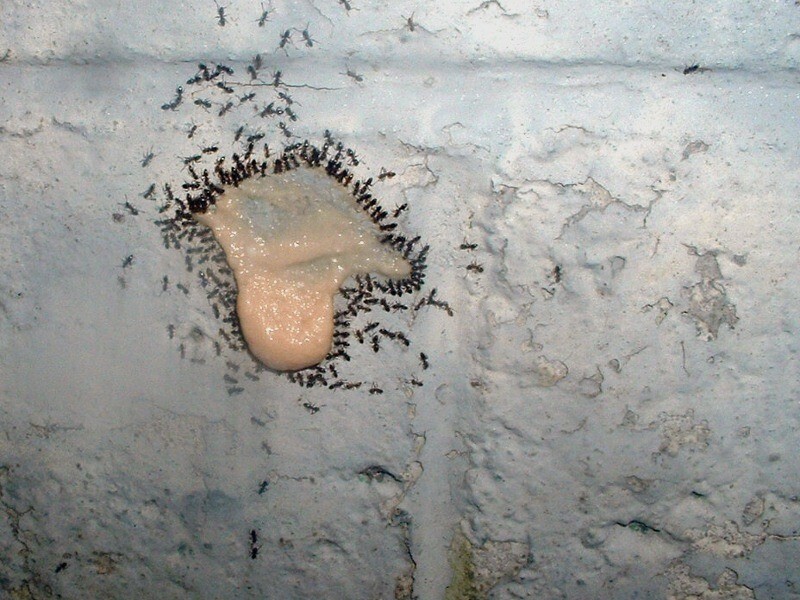 By having a delayed reaction, there is time for the 'baited ants' to return to the colony and share the bait with others, including the queen. On average, it will take about three days to kill the entire colony. By careful observation of ants in my kitchen, I have learned that they have a 'one track mind'. If you spill a bit of sugar and an ant finds it, it will take a sample of the sugar back to the colony. The other ants, having tasted the sample, will set off to find more. If you place the preferred protein in their path, they will completely ignore it. They sampled sugar, they want sugar, even at the cost of doing without protein. For this reason, when using ant bait, the area must be clean and free of other substances except the bait. If they find something else first, they will ignore the bait. My concoction? Nothing more than a tablespoon of beef baby food to which a fourth teaspoon of boric acid has been added. I decided to try to attract some ants for a picture to go along with this post. So, besides the globs of bait on tree trunks, on rocks in flower beds, etc., I put a glob on a foundation block. The results you see in the picture were obtained in about thirty seconds. This is great.My daughter can't get rid of ants. Also u can put apple cider vinegar(not too much, in a plastic bottle(cut the bottle in half. )then put 2-3 drips of Dawn dish detergent.it works great,too.You'll be surprised at how many gnats there are. Here is an update to the post. I cut wieners into 'pennies' and dusted them with boric acid. The ants seem to relish these as much as the baby food. If you have reservations about wildlife finding these 'pennies', shove them into the narrow opening of a small soda bottle. My only concern would be with wildlife also wanting to eat the bait...i.e., skunks, opossums, raccoons, etc. If the bait is placed in a hard to reach area for the wildlife (but easy for the ants) it would seem to be ok, particularly if only a very small amount is used. If ingested or inhaled, boric acid can decrease the acid balance in a pet's body, causing cardiovascular, respiratory or renal distress and possibly failure. Symptoms of boric acid poisoning are general physical distress, including nausea, diarrhea, vomiting and disorientation. Is Boric Acid Safe for Pets?